The question is the answer. Dr. Who is the title of the BBC-produced television series that is developing a large, loyal cult following here in the States. Whovians, as they call themselves, are being treated this summer to seeing some of their heroes in person, as the Dr. Who Fan Club of America is sponsoring a national tour to promote the program. Recently, the tour stopped in Chicago for a two-day festival at the Granada Theater, where even the most die-hard Whovians could get all they wanted of the Dr. Who legacy, trivia and paraphernalia. TO ENTER the theater was to be deluged by Dr. Who t-shirts, books, key chains, bumper stickers, pins and a million other items a true Who fan can't live without. But the real treat came deeper inside the theater when early, never-shown Who episodes were played for the American audiences, giving fans a new and deeper perspective into the multi-faceted personality of "the Doctor." For non-Whovians, those who may be uninitiated in the Dr. Who mystique, the show has run in England for nearly 20 years. But the programs now being broadcast in the States are the more recent episodes, which creates a curiousity with the American audience about the Doctor's "roots". THE DOCTOR is a member of the Time Lords from the planet Gallifrey, an advanced and highly intelligent race who have mastered the ability to travel through time and space. Every few years, the Doctor's physical appearance goes through a metamorphsis. In real life, that translates into a new actor assuming the lead role. To do so is a risky ploy in television, but one that has proved successful for the program, allowing the different actors to add their insights and interpretations to the Doctor, much to the pleasure of Dr. Who followers. After seeing some of the original episodes, Whovians appreciate the transcendental nature of the physical being they know as the Doctor. BUT THE highlight of the recent festivities for most Whovians was the chance to meet Jon Pertwee, the current Doctor, and Lis Sladen, who plays Sara Jane Smith, one of the Doctor's attractive female companions. Ms. Sladen, who was making her first visit to the U.S., said the people she has met here have made her "feel just great." "What really surprised most on the tour is people call me Us (pronounced Liz) and not Sara, my character's name on the show," she said. "That's nice." "We thought we'd get a good response in the large cities here, but I was really surprised by the reaction from the smaller cities like Philadelphia," she said, apparently unaware that Philadelphia is the country's fourth largest city. Pertwee, a dapper English gentleman, said playing the Doctor is one of the most coveted roles in British television. "The show is very well respected and has excellent prime time ratings in England," he said. "I TRY to do the opposite of what some of the Doctors before me have done, which I believe adds to the depth of his character," Pertwee said. Pertwee's rendition of the Doctor is somewhat of a "science fiction James Bond," Pertwee saids, choosing to dash through the universe every week dressed in his real-life grandfather's cape. The stateside success of Dr. Who a success remains an unknown. But when a public television' station runs the show, good ratings seem to follow. Chad Roark, co-founder of the Dr. Who Fan Club of America, credited the humor of a previous Doctor, Tom Baker, for the success. "For most people, Dr. Who is Tom Baker," Roark said from the fan club's Denver headquarters. "His sense of humor he gave the character seems to have hit the American sense of humor right on," he added. BAKER, the fourth incarnation of the Doctor, is an eccentric looking and acting man, who has a gift for understatement. His extremely quick wit alone have made his episodes fun to watch. 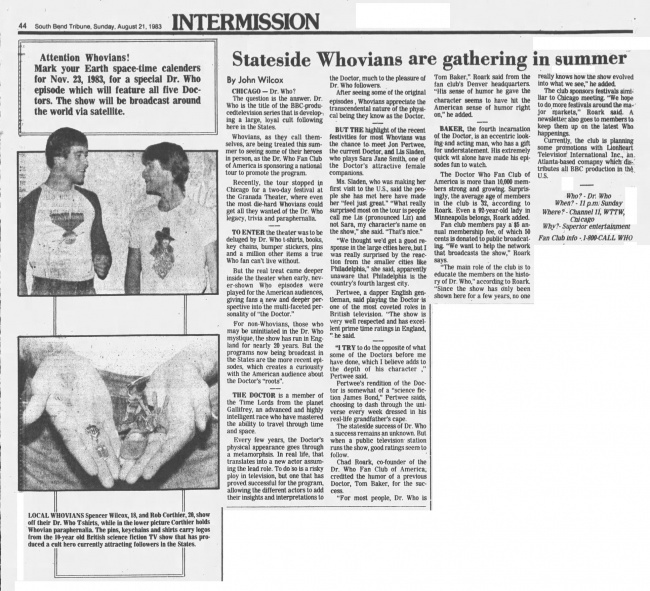 The Doctor Who Fan Club of America is more than 10,000 members strong and growing. Surprisingly, the average age of members in the club is 32, according to Roark. Even a 92-year-old lady in Minneapolis belongs, Roark added. Fan club members pay a $5 annual membership fee, of which 50 cents is donated to public broadcating. "We want to help the network that broadcasts the show," Roark says. "The main role of the club is to educate the members on the history of Dr. Who," according to Roark. "Since the show has only been shown here for a few years, no one really knows how the show evolved into what we see," he added. The club sponsors festivals similiar to Chicago meeting. "We hope to do more festivals around the major markets," Roark said. A newsletter also goes to members to keep them up on the latest Who happenings. Currently, the club is planning some promotions with Lionheart Television' International Inc., an Atlanta-based comapny which distributes all BBC production in the U.S.
Caption: LOCAL WHOVIANS Spencer Wilcox, 18, and Rob Corthier, 20, show off their Dr. Who T shirts, while in the lower picture Corthier holds Whovian paraphernalia. The pins, keychains and shirts carry logos from the 10-year old British science fiction TV show that has produced a cult hero currently attracting followers in the States. Mark your Earth space-time calenders for Nov. 23, 1983, for a special Dr. Who episode which will feature all five Doctors. The show will be broadcast around the world via satellite. APA 6th ed. : Wilcox, John (1983-08-21). Stateside Whovians are gathering in summer. South Bend Tribune p. 44. MLA 7th ed. : Wilcox, John. "Stateside Whovians are gathering in summer." South Bend Tribune [add city] 1983-08-21, 44. Print. Turabian: Wilcox, John. "Stateside Whovians are gathering in summer." South Bend Tribune, 1983-08-21, section, 44 edition. This page was last modified on 11 February 2019, at 03:33.